T20 was not meant for them.They always were compared to be the test/ODI players. In the end, the oldies proved that T20 is not just about power and speed.Today, when Sachin and Rahul played superb knocks for their respective teams ( in 2 different games ), one must say that "form is temporary, but class is permanent"! 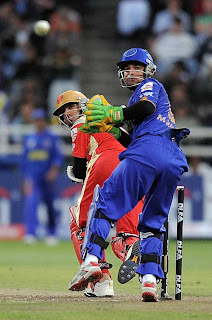 Even Anil Kumble proved his critics wrong; wrapping Rajasthan Royal's innings with brilliant 5/5 spell. "I'm happy with the way I'm hitting it and it was good to get the team out of the hole. This was always going to be a good score in the conditions, you've got to play proper cricket, as it's not going to be easy hitting every ball. It all worked out well, and it was a good start to the tournament. The bowlers responded well and it was just brilliant."